Here is a dandy do-it-yourself loudness exposure meter. Send your final output mix over to an Aux Bus, and place an EQ followed by an R128 Loudness meter. The Aux Bus doesn’t need to feed any output channels. It’s just a measurement bus. The EQ provides sound shaping to simulate our hearing, and corrects for the loudness perception filtering inside the R128 Loudness meter. In this case we aren’t attempting to simulate perception. Rather, we just want to see physical exposure. In the example shown here, I have my system now calibrated for -23 LUFS = 73 dB(C), as per EBU 3343. With this calibration, 0 LUFS = 96 dB(C). The equalizer provides approximate dB(A) shaping, as called for in the loudness exposure guidelines. So I placed the yellow divider on the Loudness meter at -11 dB to provide warnings whenever my integrated loudness level exceeds 85 dB(A). That’s the maximum safe exposure, sustained, for up to 8 hours. The A-weighting is provided by the HPF/LPF combination. That HiShelf filter is to counteract the internal Pre-Filter of the Loudness meter, which emphasizes high frequencies. Most people probably have little reason to watch something like this. But if you are using a Crescendo, and your vTuning is 60 dB, or especially if higher, then it might be a good idea to monitor your exposure. You can’t hear the strong highs as strong. But they are. And it’s the physical assault that needs to be watched, even if you can’t hear it as such. I have the output of my Crescendo piped into this meter on its way out to the headphone amplifier. My meter is currently showing integrated loudness at -16.4 LUFS, or 79.6 dB(A). So I don’t need to worry as I listen to Massive Attack on their Mezzanine album. Output gain from EQ should be +1.5 dB to make readings agree on the EBU Noise Reference track at -23 LUFS. Here is our loudness exposure model graph from the other day, now updated to include the Cobalt test tracks. It shows in bold magenta, the dB(A) measurements on each track. The faint magenta shows the same tracks measured for R128 Loudness. 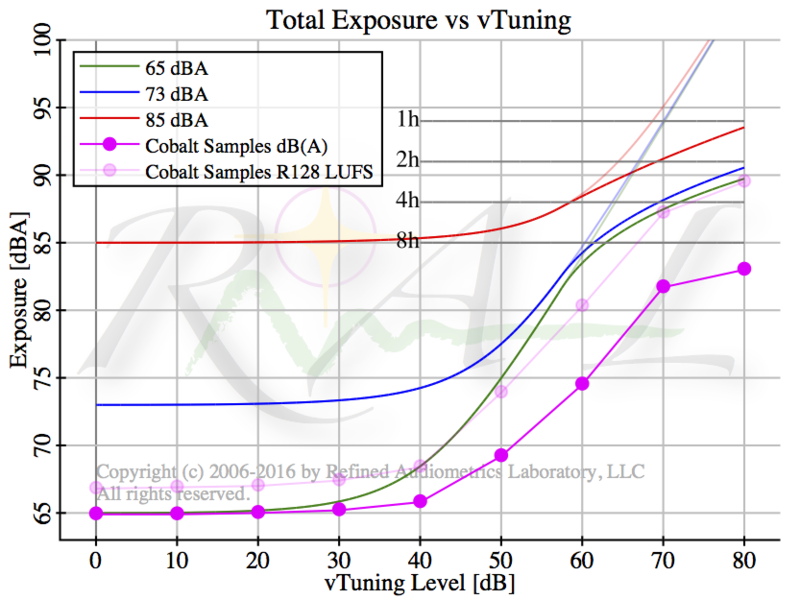 As you can see, R128 LUFS overestimates the sound intensity exposure everywhere, being about 2 dB hotter for straight listening, while growing by more than 6 dB hotter when Crescendo is used with extreme correction levels.